Best Baby Toys For 6 - 12 Months - I Can Teach My Child! With Little Sister being our third child, we have been around the block when it comes to choosing baby toys, going through just about every toy imaginable in our nearly 7 years of parenting. I can tell you one thing: a lot of the toys for toddlers or toys for babies are just plain not worth it. They are plastic junk that eat batteries and don’t hold the attention of young kids longer than the entirety of the musical diddy incessantly playing…that, for the life of us, we can’t find the “off” button to. In honor of this, we’ve compiled our list of the best baby toys. These baby toys are simple and as natural as possible. Below are some of my favorite baby activity toys… some of these baby toys we have, some others we use to have (and love), and some we want. :) These baby toys are suitable as either baby girl toys or baby boy toys. 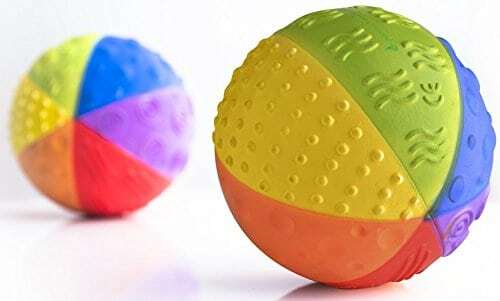 This awesome sensory ball is made with all-natural rubber and food-grade paint, which means it is 100% safe for your baby to put his/her mouth all over! When the ball twirls, the colors make for a fun sight for baby as well. This baby toy has been played with by all 3 of our kids and most recently has saved dinner time for our family. Little Sister (8 months) is not crazy about sitting in her highchair unless she has food being shoveled into her mouth. This keeps her occupied while the rest of us eat and chat… and the suction cups keep it from being thrown on the ground (like every other toy we have tried to give her). Not to mention, the beads are great for hand-eye coordination and fine motor development! Sophie wasn’t around when our older two were babies, but she has become a beloved member of our family since Little Sister’s birth! She is great to chew on (especially with teething) and her neck is easy to hold. This simple baby toy is great for keeping little hands busy (hello church or doctor’s office) and it can also be helpful for teething babies. If you have a baby who loves to chew jewelry, this is a great toy for him/her! This puzzle has (miraculously) survived all three kids and is one of the best baby toys! I love this puzzle (more than the other few varieties) because it helps reinforce animal sounds, which I think helps a great deal with language development. This toy for babies is just the coolest thing ever and is on my list for Little Sister this Christmas! Research has shown that babies prefer to look at the human face more than anything else…so why not let them play with faces! :) The great thing about this baby toy is that you can easily adapt it for the age of your child! Once he/she has outgrown looking at photographs, put alphabet letters or numbers in there and use them to make a game for your 3 to 5 year old. The possibilities really are endless! What was/is your best baby toy? We love the stack-n-roll cups. My kids love it from sitting to maybe 2 1/2 years, though my big kids, 7 and 3, still use them in their games since they’re around the house. You can make spheres out of them, sort them, count them, use them as bowls for play food, use them to collect/sort colored objects, nest them, stack them, etc, etc, I will never, ever get rid of ours. I’ll have to check those out! Thanks Katie!